Oh, how fast they grow! Did you think I was JUST talking about my Sisterlocks?! Gotcha! I'm and I'm not actually... I have been just so touched by how fast my kids are growing. These girls are my twins. Two-thirds of my offspring. 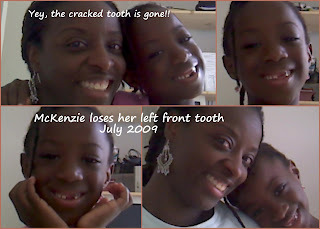 McKenzie here just lost her first top tooth on Friday. 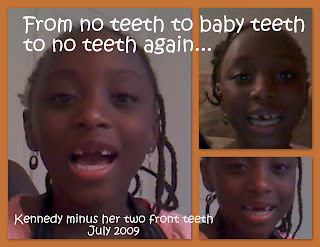 While, her twin sister (the older one by 20 minutes) lost her second top tooth just the day before on Thursday. 'Cause guess what? We are all the happier for it. Water is now OUR friend. Hope you, too, are enjoying your summer, Natural Journeys family! Your twin daughters are so beautiful! I know you are a proud mom! It's interesting how our hair strongly influences our decision about exercising. It almost seems as if we went from one extreme to the other i.e. permed hair= avoid water, rain or any form of exercise that will cause you to sweat, versus, nappy hair= water is now our friend and feel free to swim, sweat and get wet! (Then again, I have issues with sand getting in my locs at the beach, lol! ) This is a great photo of you looking so peaceful as you float in the water. Dewdrop, girrrllll... you ARE SOOOOO RIGHT ABOUT THE SAND... YIKES! !